It is with great sadness that we have to report the death of Maurice Marshal MBE co-founder of Stage Electrics, Chief Electrician at the Northcott Theatre Exeter and influential industry figure for many years. Maurice died Saturday 10th July at 1pm after a long battle with cancer. His funeral is arranged for Tuesday 20th July at St. Saviours House, St. Agnes Avenue, Knowle, Bristol, BS4 2DU. A lifelong passion for the technical side of theatre saw Maurice pursue a dual career as a partner in Stage Electrics and also as chief electrician at the Northcott Theatre in Exeter, where he launched the careers of a number of the country’s top stage lighting designers and technicians. 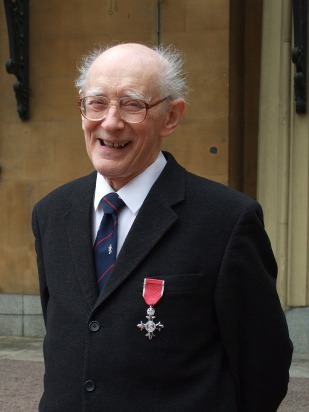 His services to drama and his commitment to training in theatre resulted in him being awarded an MBE in 2009. Maurice co-founded Stage Electrics with David Whitehead in 1979, a company which has grown into an internationally trading business with a turnover of £27.5 million. Recently, with the onset of illness, Maurice has helped create the current management structure to ensure that the company continues to thrive without his guidance. Born on May 8th, 1934, Maurice grew up in Exmouth, attending Exmouth Grammar School. On completing his education and after a brief spell in farming, Maurice joined The Royal Electrical and Mechanical Engineers where he qualified as a tank mechanic. Maurice left the army in 1955 and began working for an Exeter television and radio shop, before establishing his own business, M.M. Electrical Contracting. When local stage lighting enthusiast George Waldren retired he left Maurice his stage lanterns and MM Stage Lighting was formed. In 1967 Maurice joined the electrics department at the Northcott Theatre in Exeter as second electrician . In 1973 he was appointed as the theatre’s chief electrician, six years later in 1979 he started Stage Electrics with David Whitehead. Branches were quickly established in Exeter, Plymouth and Exmouth and originally equipment was moved between the towns on local buses. Over the years, his philosophy of prioritising individual customer needs and responding to them has helped the company develop into a market leader. Whilst at the Northcott Theatre, Maurice established a two-year apprenticeship scheme for theatre electricians, persuading the changing theatre management to stick with the scheme. 56 trainees went through the apprenticeship, and many becoming members of the media and entertainment Union BECTU they became affectionately known as the Northcott Bro’s. Jeremy Dunn, Head of Sound at the Royal Shakespeare Company; Sid Ellen, Head of Lighting at the Ballet Rambert; Martin Lilley, Director of Entertainment, Cunard Lines; and Simon Bowler, Head of Facilities at the Royal Shakespeare Company and Hugh Vanstone, Laurence Olivier Award winning lighting designer. Maurice himself was lighting designer on a number of Northcott productions which transferred to the West End, including Abelard and Heloise which starred Diana Rigg. In addition to being the BECTU representative at the Northcott, Maurice was heavily committed to training and getting training recognised nationally. He worked for many years to develop course content for a nationally recognised NVQ in Theatre Lighting & Sound. Maurice also qualified as an NVQ assessor in order to facilitate the delivery of the qualification. Maurice's dedication to the theatre industry was officially recognised in 1997 when he was named ABTT's Theatre Technician of the Year, and in 2006 when he was awarded a Fellowship for the Association of Lighting Designers. In 2009 he described himself as “overwhelmed” to receive an MBE for services to drama. Throughout his life Maurice was a devout Catholic and a member of the Society of St Pius Xth. In 2006, at the age of 72, he embarked on yet another business venture, this time running Carmel Books, a company distributing publications for the Catholic Church. Maurice eventually retired from the Northcott Theatre on a high in January 2009, having seen the theatre complete a multimillion pound refit and then taken it through its first new production, a Christmas pantomime. Maurice operated the lighting desk for his last show. Maurice leaves behind a successful and vibrant business and a legacy of people he has trained and worked with in the Theatre Industry over the years. He will be missed by his colleagues at Stage Electrics, the Northcott Bro’s and the many people he helped, guided and mentored over the years. with a short note explaining that the donation is in memory of Maurice. There will also be a retiring collection for Hospiscare after the funeral.